I've spent a couple years (literally. years.) slowly transitioning to a more whole food diet. Change is hard, but easing in one step at a time is so. much. easier. than going all-in right out of the gate. So today I want to share one of my very favorite whole food routines. 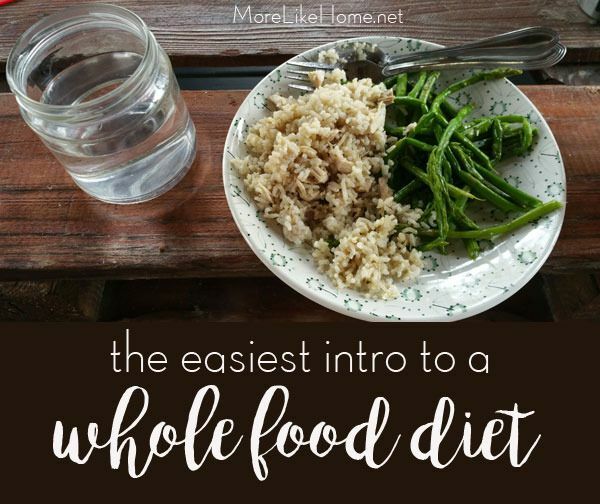 It's a great way to get lots of nutritious, whole-food goodness going on in you kitchen without investing a lot of time or a lot of money, plus it stretches to cover several meals. And it all starts with a chicken. I know this is way off our usual path, but let's be honest - I spend a significant amount of time feeding the little boys running all around this place, so the food they eat is something that's on my mind a lot. And I was thinking it might be on yours, too. So here's what we're going to do: cook a chicken, and make some broth. Easy, real food staples to get us going in the right direction. So let's get started. Step 1: buy a whole chicken. 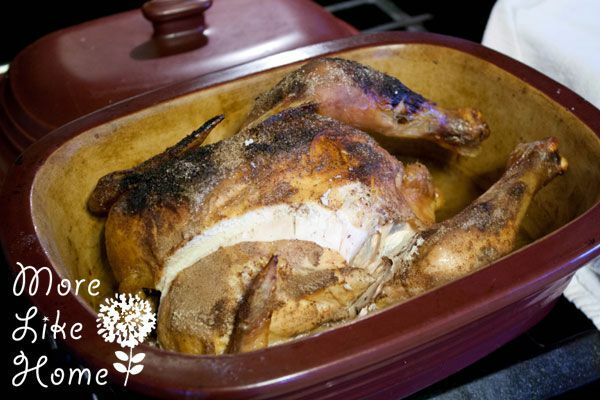 We look for organic chickens and when they go on sale we buy a bunch and stash them in the deep freeze (thaw them before cooking). Open it up and check to see if there is a package of gizzards inside the chicken (you don't want to roast it with the wrapper inside). Don't panic about the gizzards. Move on to step two. Larger birds might take a little longer too cook, use a thermometer and keep that guy roasting until it's a balmy 180 degrees all the way through. Congrats! You just cooked a whole, real chicken! 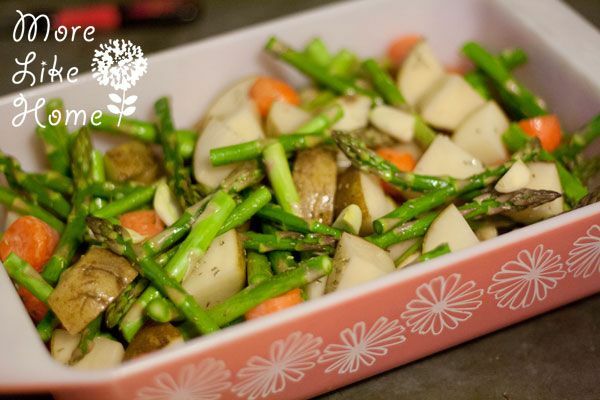 Add some veggies and you'll have your first whole-food meal on the table. I like to throw carrots and potatoes right in with the chicky while it's roasting, or you can do any veggies you like in a separate roasting dish with some oil and seasonings (wait until the last half hour or so to put them in). And that completes your first whole-food meal. Yum yum! But wait, We're not done with that chicken! There are a few more important steps in this whole-food routine. Once everyone is full, I go ahead an pull any leftover chicken off and put it in a container in the fridge for another day (we love these containers). Now you can use everything left (bones, gizzards, etc) to make some yummy and nutritious bone broth. 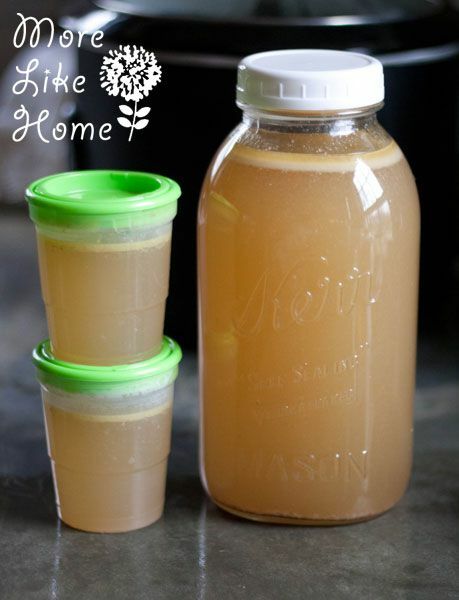 Bone broth is packed with vitamins and minerals and can be used for tons of recipes throughout the week! And as a bonus... it's basically free. Just put all the pieces in a large pot, fill it with water, and let it simmer for about 2 hours (I don't sweat the time too much. Sometimes it goes longer, sometimes I can only squeeze in an hour. Whatevs. We're doing what we can here, folks.) 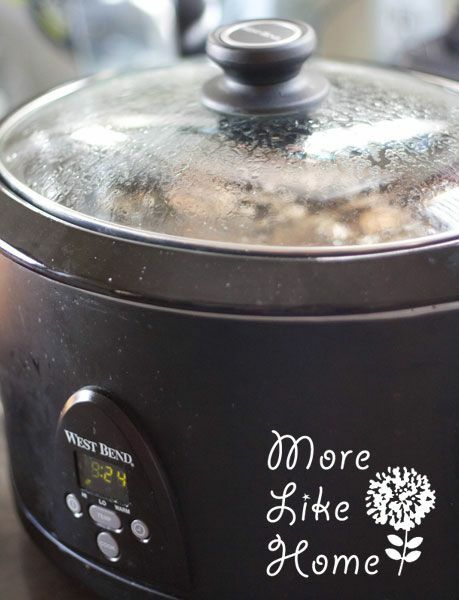 You can also put in the crockpot on high for up to 12 hours if that fits your schedule better (I'll sometimes do this if we want to go to the park or something and not wait around for broth to simmer). When it's done, let it cool to room temperature then strain it through a mesh colander to get out any pieces. I usually put a half gallon of broth straight into the fridge to use throughout the week, then pour the rest into containers (like these) to store in the freezer until I need them. Before Baby #3 was born, I roasted 3 chickens to start a nice freezer stash. I pulled all the chicken off and stored it in freezer bags, then made a couple gallons of broth to store in the freezer as well. When I ran out of freezer jars I dumped all the frozen cubes into freezer bags so I could go ahead and reuse the jars. You can use your broth to make all kinds of soup during the week, make your own cream of chicken soup for recipes, warm it up in a mug for a winter pick-me-up, or use it in place of water for cooking things like rice. Which brings us to one of my all-time favorite, easy real food lunches. This is the meal I make when I just want the boys to eat without a fight. And did I mention it's easy? This one starts with rice. 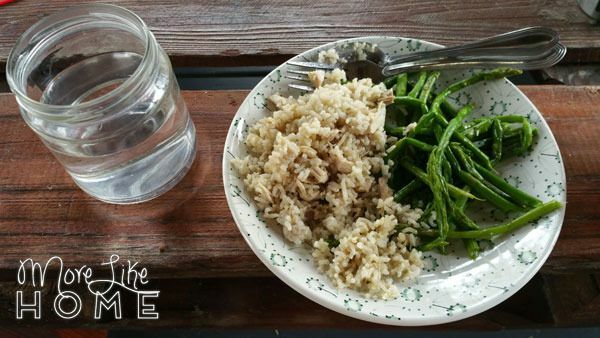 If I think of it, I will soak one cup of dry rice in a bowl of water overnight (but if not... oh well). Then I'll drain it, rinse it, and throw it in a pot with two cups of our yummy broth. Bring it to a boil, then cover it and reduce it to a simmer for 15 minutes. Then I mix in some of the left over chicken, a little butter, and a little salt. Serve it with a veggie and call it a day. This time it was frozen green beans simmered until they are tender then tossed with butter and salt. Easy. Yummy. Kid friendly. And just like that, you have a handful of healthy, whole-food meals from one little chicken. I do this almost every week because it's such an easy way to put good food on the table. It takes a little more effort than a frozen pizza, but it's not hard and I really believe it's worth it to put real food in these little growing bodies. I don't know if organic is really better than non, or if GMO's are dangerous. But here's what I do know - I trust food God made, more than I trust food man made. So we do our best to avoid pre-made meals with ingredients we can't pronounce most of the time, and instead buy healthy ingredients to make our favorite foods from scratch. We look for food that comes from the earth, not from a lab. And I hope you didn't miss that key phrase - most of the time. I would go batty if I had to put perfect whole food on the table every meal of the week. So I do it most of the time. I do my best to plan ahead and have easy go-to meals in the fridge. But sometimes I don't. Sometimes we have a box of mac & cheese with a side of crackers for lunch. And know what? It's still a good day. What's your favorite tip for whole-food cooking?